This page is to talk about how I use the various wildly and fast moving “social media” connections, links, and whatevers on the web. It is truly amazing how fast everything changes, and for someone closer to 50 than 20, it can feel overwhelming, but I try to keep up or just plain fall behind. When I picked up my new laptop recently, the very intelligent young man walking and talking me through the tiles (see, I got the term right – tiles) on Windows 8, moved at warp speed and I took quick notes – because I knew I wouldn’t remember “tap” this or “hit ALT” to do that, and “swipe here to move there” — but I did realize something as he did his laptop review with me – the features he was enjoying were more like enjoying TV or Video Game options. He was enjoying the tiles in a different way than I think I would, but I am always willing to learn or catch-up somehow. One I’m adding today (August 2015) and should have done sooner is Instagram. It is an online mobile photo-sharing service that enables its users to take pictures and share them. You can view my Instagram photos and click a little heart to indicate when you like the photo posted, or enter a comment by typing it in on the bottom right of the screen. Hashtags # are used on mine here and there to categorize the topic, so when others using hashtags want find things like, for example, images of big red banana plants (Ensete) photos, which is my latest plant obsession, they can search #bananaplants, or something similar. 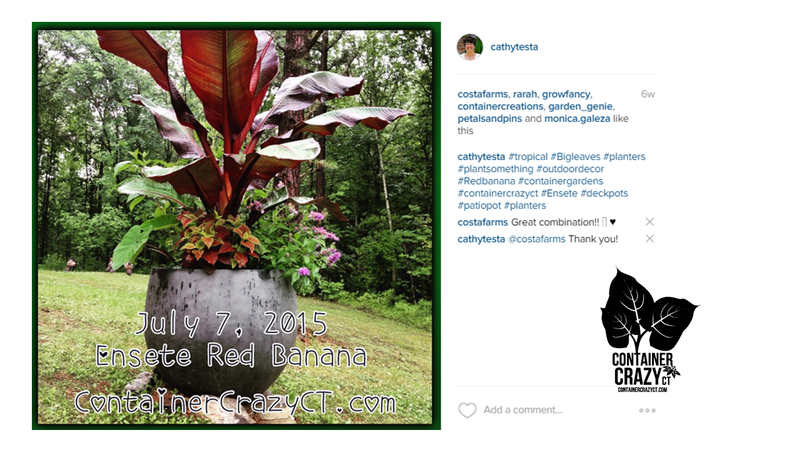 All summer, I instagramed photos of my red banana plant’s growth progress. Why? Because I think it is beautiful and amazing to see how large these tropical plants will grow in our Connecticut planting zones in container gardens. Also, because I sell these at my container garden workshops every May because, in my opinion, they are a must have. Instagram is Insta-fun. It becomes addictive. It would not be an exaggeration to say, sometimes in the mornings, when visiting my chicken coop or watering plants, I take out my iPhone and spend at least 20 minutes to get another “snapshot” of a plant, a bug, a bird, a piece of grass – for crying out loud. You can follow other Instagram users on it and see the world this way too. How wonderful is that? Seeing a plant person’s passion in Thailand. Probably the only downfall is when viewing Instagram on the computer, you are not able to post pics via it – it is done thru iPhones, etc. I’ve always enjoyed taking photos of plants. Gosh, I have photos in my honeymoon album from 25 years ago in Hawaii that contains more photos of plants than the happy couple. Another cool aspect about Instagram is looking at a year’s worth of past photos and realizing how amazing life is when reflecting on the days past and photos of prior seasons. It can serve as a database for you. OK, I’ll start with TWITTER. I picked this free (it better be) logo of the little blue icon bird for Twitter because he looks a little silly, and that is how I feel when I try to find my way through Twitter. At first, I wasn’t into Twitter – Why? Because I can’t seem to keep TWEETS to a limited amount of characters – I like to write paragraphs, but then I discovered Twitter is wicked cool for connecting with people around the “world!” Yes, I can find a garden or plant lover in the UK or in Ireland, or in Alaska! And this is really neat to me. I like seeing when someone I’ve never met before has the same exact passion as me or has a really cool idea. To me, Twitter introduces you more to new faces and friends than FACEBOOK does. Facebook is great for…well, wait, I’ll get to that next, but Twitter really shows you about people ‘not around your immediate area,’ and I think that is super cool. Its like traveling the world right at your desk, AND you also can find amazing resources by people just like you or me interested in just sharing what they know about plants, gardens, container gardens, and landscapes. Not all of the people, oh excuse me – Tweeters, on Twitter are there to make a buck. Many are there to “inspire.” You just have to sort them out. I just started learning, too, about the famous hash tags. # There it is! You know it I’m sure, but to me this was a ‘pound or lb symbol’ which we used on a keyboard for math equations — or I don’t remember what else now that it has changed its personality, but somehow the word ‘pound sign’ turned into hashtag. I actually had to look up a video to find out how it is used on Twitter. I got it – it categorizes topics, so lately I’ve been including things like #containergarden or #plantsomething when I tweet about my container gardens, for example. And it is another way to find others talking about container gardening, which I also love – the sharing aspect. But what I still haven’t figured out is how to share conversations – I don’t know why I can’t seem to just instantly figure this stuff out on Twitter, but I’m trying. On my blog’s menu sidebar, you will see a list of my latest tweets from my Twitter “feed?” – I think that is what they call it. And under my profile pic, you can click on the little Twitter bird icon to find me. I was really happy when I added the “feed” to my sidebar because I don’t know HTML code, but thankfully WordPress is good for people like me. I’ve learned all on this blog on my own by the way, by struggling with the features and links, so when you see corks on my screens or pages, this is why – I’m no techie. FACEBOOK, Been there a while. You can blame my youngest sister for my obsession with Facebook, although I think I’ve been better recently with not being on it 24 x 7. She told me about it because I think she recognized, when I started working from home on my horticultural business, I needed to connect with friends and people. And it is so great for connections with my local townie friends, people in areas near by, and family. Love Facebook for events and invites, seeing photos of my family up north in Canada and in Vancouver too. Without it, I would not know my cousin loves to travel to England or see her photos. Or have a chance to see my Uncle Louis’s AMAZING vegetable garden photos. Or my Aunt’s super beautiful quilting projects. It is such a great place to share our lives, but it can also sometimes cause misunderstandings. Something is posted and you didn’t agree, and “bam,” next thing you know, you unfriend or they unfriend you. That can hurt both ways. But luckily, that doesn’t happen often. I wrote a topic about how using Facebook compares to gardening and the risks involved, see HERE. Actually, it was on Social Media and Gardens facing the same challenges. LINKED IN for me is LINKED OUT. (Sorry). Okay, this is the scoop with Linked In. I can’t seem to get there. My bad! I setup a profile about 2 years ago, and never visited it again – they say this is taboo. I don’t know why, but I haven’t gotten into Linked In the way I should. It reminds me a little of my former corporate life. It is “business-ey”, and, yes, I’m have a business, but I feel my business is more on the crafty, visual side, so I find I’m more attracted to social avenues like Pinterest. Oh gosh, do I ever LOVE Pinterest. ….Oh, if you have asked me to Link UP with you, my apologies, I’m very sorry I haven’t yet and it is nothing personal, I just have to get educated and learn more about Linked In as soon as I finish catching up on Twitter, Instagram, and Pinterest. I hear Instagram is the hottest right now for news? I read that somewhere on a blogger’s page. Hmmm…OK, back to Pinterest, which I LOVE. I told a nursery owner a LONG TIME AGO, people love pictures. I always love a picture when I want to understand something, what it looks like, how it works, etc. That is why I enjoy showing design images of possible scenarios of garden designs with plants to my clients, (rather than just circles and lines on a scaled drawing)…and why I love taking photos of plants, and viewing photos of gardens, container gardens, and more. Pinterest is so cool for sharing ideas, crafts, inspiration, holidays, and many, many pictures. I have pinboards on my Pinterest page (some are “secret” pinboards I share with only my clients of garden designs). To see my Pinterest page, just click on the little icon below my profile pic on the right side bar of this blog (Oh wait! I haven’t learned how to add that one yet). Go to this link instead: Cathy’s Pinterest Boards. When I post to Pinterest, more often than not, I’m thinking about YOU – the people, friends, and clients who enjoy my plant related information, have attended my Cathy T’ Classes on making creations, and anyone else interested. Have you heard of it? I haven’t, but just happened to catch an article about it in the Technology section of “Bloomberg Businessweek’s Aug-Sept 2013” issue. Medium is being or has been developed by Ev Williams. Do you know who he is? As the article noted, he sold “Blogger” in the late 1990’s, for an undisclosed amount, before co-creating Twitter. Yup. So check out MEDIUM site for the next new big thing – at least I think it’s new…just wait, there will be something else on the social web horizon to learn and browse. In fact, I think there’s really no catching up anymore, just going with it – kind of like how the younger generation does with the web and technology. I don’t see many people in their 20’s fretting over this stuff like I do. Oh and what is Medium? Go see the home page to find out. It seems to be “dialogue” between writers and bringing them together. I’m going to register right now to check MEDIUM out. Great synopsis of how you use the different outlets! Good luck! Great rundown of the different social media platforms!